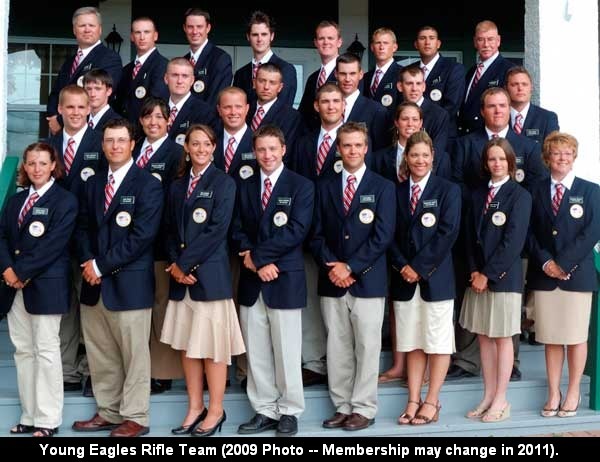 In October of 2011, the “Young Eagles”, the Under-25 American Rifle Team, heads to Brisbane, Australia for the World Under 21/Under 25 (U21/25) Long-Range Team Championships. To help the Under-25 Team, Berger Bullets generously donated 100,000 30-cal bullets. Sales proceeds from the bullets will help pay the team’s travel costs and other expenses associated. So far, only about 11,000 bullets have been sold, so the team needs more bullet buyers. Bullets offered for sale are all 30-caliber, 155.5 grain Palma bullets. Minimum order is 500 bullets for $195.00, which works out to $39.00 per box of 100. • Shipping: 100 bullets per box, free shipping within the 48 states. Share the post "Berger Bullet Sales Support USA Young Eagles Rifle Team"
In the last week of December, 2010, two pending FTR records were set at the annual Snowbird X-Miss Match hosted by Florida’s Port Malabar Rifle and Pistol Club. Competitors traveled from as far North as Michigan (through heavy snow). At the match, conditions varied over the four days of shooting from 25-mph winds, to below freezing temperatures and frost, to burning swamplands including falling ash. In a superb performance given the conditions, Kent Reeve was Palma rifle and overall winner with 1799-99X (dropping only one point over the 3-day event). Keith Perry was overall iron sight winner with 1781-107X. 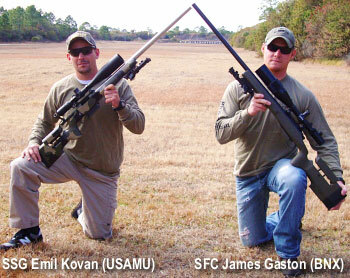 SSG Emil Kovan (USAMU) and SFC James Gaston (BNX Rifle Team) took turns setting and resetting the NRA 600-yard individual NRA Service record. SFC Gaston shot a 198-11X, only to be bettered by SSG Kovan with a 200-11X. Kovan uses a GA Precision-built, Surgeon-actioned, .308 Win rifle. It has a 26″, 11-twist barrel for tactical competitions, plus a 29″, 10-twist twist tube for F-T/R, both chambered in .308 Win. The 26″ BBL is chambered for 175-190 grain bullets, while the 29″ is throated for 210-grainers. Kovan shots moly-coated Berger 210gr VLDs in the longer barrel. He reveled that he loads “bullets long so they get soft seated .010″ when [closing] the bolt”. In F-TR class, SSG Kovan won for the second year with a 1772-75X, Nik Taylor took second overall with 1769-69X, SFC Gaston took third place 1739-75X. In an extremely tight race in F-Open Class Michael Dana was first with 1765-36X, Mark Finizio took second with 1764-68X, Tom Goodman finished third with 1763-62X. During the team matches on the final day, the BNX rifle team from Coastal Carolina Rifle Club at Camp Lejeune shot a new, pending F-TR 4-Man Team National record with a 794-37X. 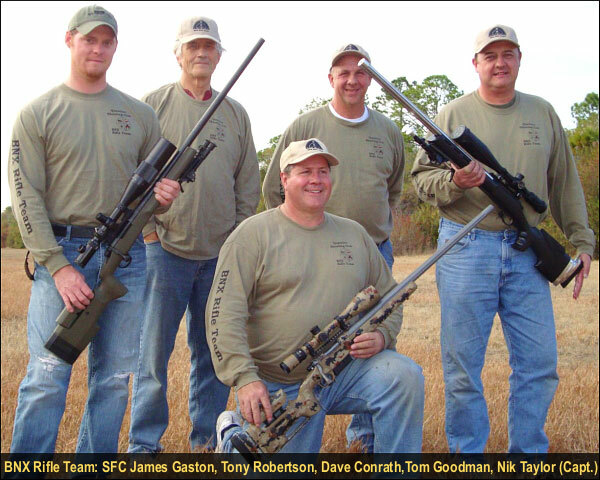 Shown below are BNX Team members (left to right), SFC James Gaston (200-9X), Tony Robertson (199-11X), Dave Conrath (197-7X), Tom Goodman (Asst. Coach/Scorer), Nik Taylor (198-10X) — Team Captain and Wind Coach. Share the post "Records Set at Florida End of Year Match"
The popular TOP SHOT TV show was a hit in its first season, so the producers immediately started working on Season 2, which will run later this year. Since Hollywood can’t have too much of a good thing, the History Channel is now seeking seeking skilled marksmen for the third season of the “Survival”-style TV series. If you missed the show last summer, it features teams of shooters competing in weapons skill scenarios. One cast member is eliminated in each round. Near the end, the show shifts to one-on-one competition, with the “last man standing” earning a $100,000 cash prize. Detailed eligibility requirements are found in the forms linked below. You can also use these forms to apply for Season 3 of TOP SHOT. Otherwise, simply email TopShotCasting [at] gmail.com with your name, city/state, phone number, a recent photo of yourself and a brief explanation of why you should be selected. If you have questions, call the TOP SHOT casting hotline: (818) 478-4570. Remember the Deadline for Applications is February 1, 2011. 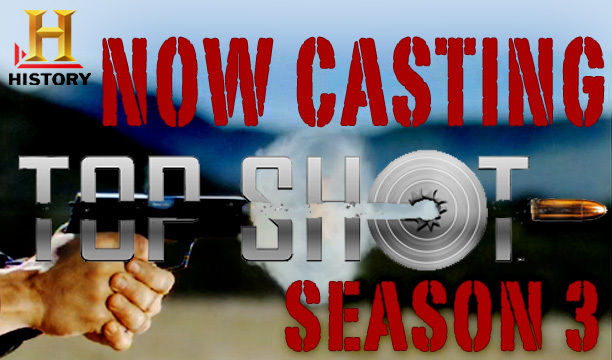 Share the post "TOP SHOT TV Show Seeks Contestants for Season Three"